Calvin Martinez is consistently one of our favorite silversmiths and excels in every one of his smithing endeavors. His designs are particularly compelling, melding the tenets of Navajo Traditional Revival jewelry with his unique capacity to hybridize the traditional. 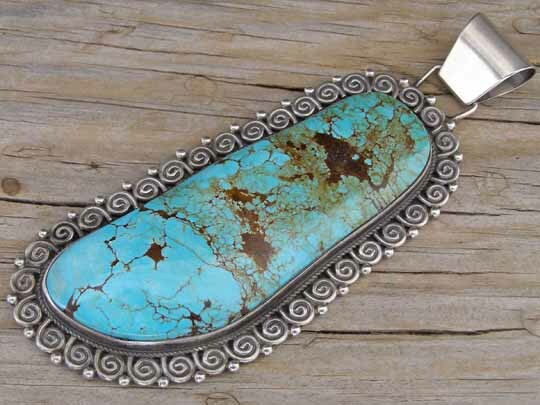 This over-sized pendant is set with a very large free-form stone of stabilized Kingman turquoise from Arizona. Calvin very seldomly uses stabilized turquoise, but this is a superior quality of stabilized turquoise which contains no dye and looks like natural turquoise. This could easily be represented as natural, untreated turquoise becasue it most certainly looks as though it is. Calvin used Sterling round wire to create decorative scrollwork along the border which is punctuated by raindrops on the edge of the borderwork. The bale on this will accomodate Erma Arviso's antiqued Sterling beads of 8 mm. diameter (see bottom of page). Hallmarked C.MTZ inside an arrowhead and stamped Navajo and Sterling on back. Stone: 3 1/4" x 1 3/16"
Dimensions of pendant (excluding bale & jump ring): 3 7/8" x 1 3/4"